1. Pre- heat oven to 350 F/ 180 C for 10 minutes. In a bowl add the maida/ plain flour, salt and the baking powder mix well / sieve together 2-3 times for even mixing set aside. 2. In a small bowl break the eggs and set aside. 3. In a large mixing bowl add the room temperature butter (unsalted) and the sugar and using an electric beater beat until its light and fluffy. 4. In goes the eggs 1 at a time and beat for 2-3 minutes after each addition. And in the vanilla essence and mix until combined. 5. Add the flour+ baking powder mix in 4-5 batches to the egg mixture and beat just until combined. 6. Add the milk and mix until combined. 7. Divide the batter into half and transfer to another bowl, add the cocoa powder to one batch and mix well. 8. Grease and 8" cake pan with butter and using a spoon alternate the cocoa and vanilla cake batter until everything is used up. 9. Using a butter knife make swirls ( I usually make an S shape swirl) and do not over do. 11. If the toothpick comes clean your cake is done, if it is still wet bake further for 5 minutes and if it comes with few moist crumbs then bake for another 2-3 minutes. 12. You cake is done if the toothpick comes clean. Remove the cake tin from the oven and place on a cooling rack for 10 minutes. 13. After 10 minutes flip the cake and let it rest in the cooling rack until it comes to room temperature. 14. Cut into pieces and serve along with your cup of tea/ coffee. 1. 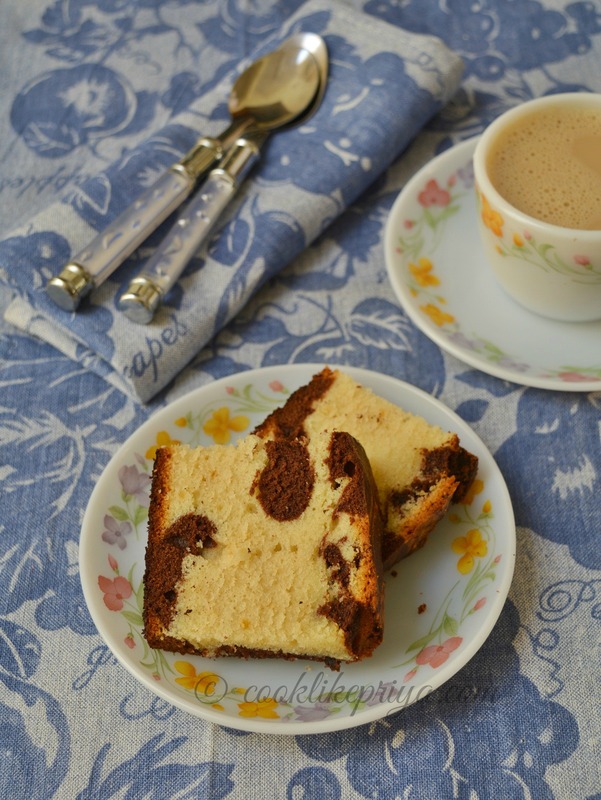 Always use room temperature butter, eggs and milk to make the perfect cake. To make the butter come to room temperature faster, cube them when they are still cold and place the pieces on a bowl. 2. For perfect butter cakes, beating the eggs and sieving the flour are ideal. Never skip these tips. 3. 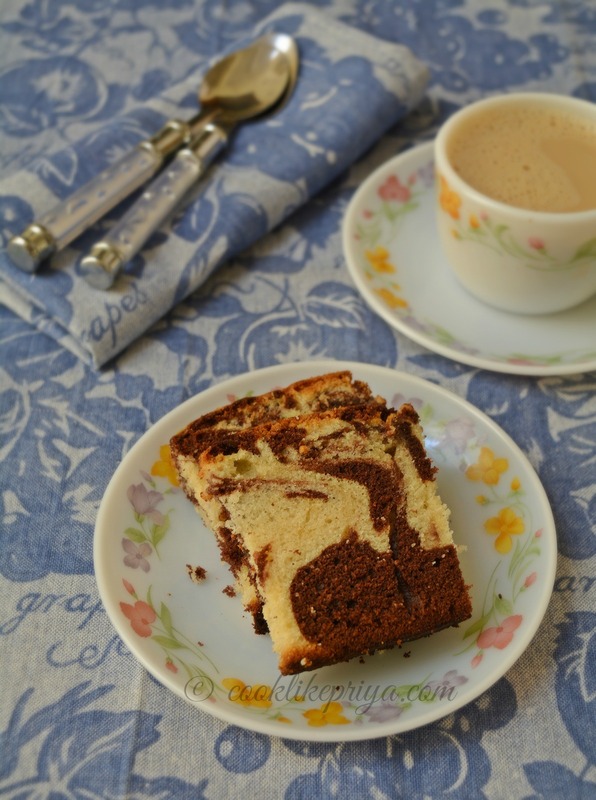 Use a good quality cocoa powder for a perfectly chocolate marble cake. Simple, easy and it's super delicious! 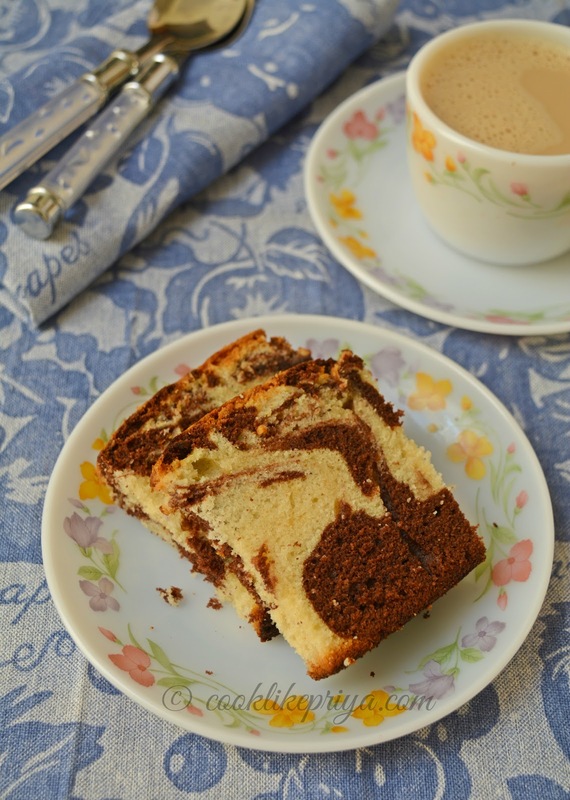 love that chocolate marble effect...:) U r such a nice baker man! 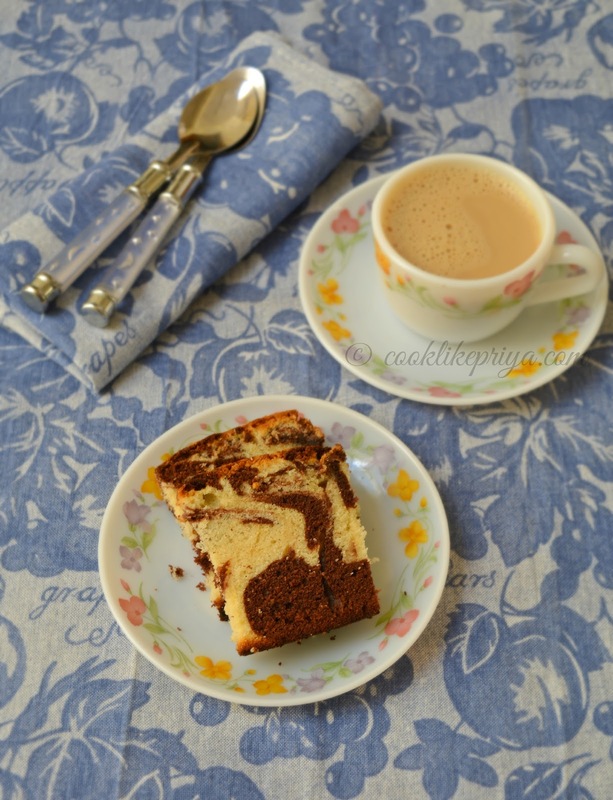 Priya, I tried ur marble cake and it came out really well. Gave it to my son's school and they were full of praises. Made two batches, one as cake (used twice the above quantity) and one batch as cupcakes which were amazing. thanks a bunch for the recipe dear. Will post it soon and let u know :). thanks again.